University of the WestIndies in Jamaica, Walcott moved in 1953 to Trinidad, where he has worked as theatre and art critic. At the age of 18, he made his debut with 25 Poems, but his breakthrough came with the collection of poems, In a Green Night (1962). In 1959, he founded the Trinidad Theatre Workshop which produced many of his early plays. Walcott won the prestigious MacArthur Foundation "genius" award in 1981. He joined the Boston University faculty as a professor of poetry and playwriting that year. He also taught at Harvard University. Walcott, best known for his poetry, is also an accomplished playwright. Of Walcott's approximately 30 plays, the best known are Dream on Monkey Mountain (produced 1967), Ti-Jean and His Brothers (1958), and Pantomime (1978). He was the 1992 recipient of the Nobel Prize in Literature. For many years, he has divided his time between Trinidad, where he has his home as a writer, and Boston University, where he teaches literature and creative writing. Kamau Brathwaite was born in the capital city of Barbados, Bridgetown on May 11, 1930 and stands as the most recognizable symbol of Barbados literature. Unlike many of his peers Brathwaite maintains strong ties with the community of the West Indies (especially in the realm of education). First as a student, he attended Harrison College (Barbados) before traveling to England to get an honors B.A. (1953) at Pembroke College, Cambridge, where he also received a Diploma of Education in 1954.He later received his Doctorate in Philosophy from the University of Sussex (1968), but not before leaving England for a time. During this time, he worked as an education officer in the government of Ghana, and began a career with the University of the West Indies (Jamaica campus) that would last for nearly thirty years. Currently he divides time between Barbados and New York City, where he is affiliated with New York University. 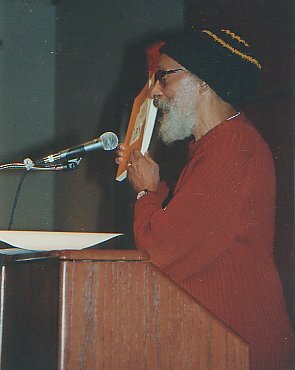 Brathwaite gained fame primarily for his poetry, despite a wealth of nonfiction and critical publications. His poetry typically explores the root of the West Indian soul, tracing historical links and events that have contributed to the development of the black population in the Caribbean. In such poems as Rights of Passage, he takes his readers on a journey through time and space, recreating the settings and voices that Caribbean people (and other former Africans) experienced. Jamaica Kincaid was born on May 25, 1949 in Antigua. She was christened Elaine Potter Richardson and she left the island at the age of 17.
twenty years (1976-1995) before the arrival of new management convinced her to leave. She published her first book "At the Bottom of the River", a collection of short stories in 1983. In 1985, Kincaid published her first novel, "Annie John". Her works drew primarily from her childhood in Antigua. Some of her other works include "Lucy" (1990), "The Autobiography of My Mother" (1996), and "My Garden (Book)" (1999) Kincaid later married her editor, Shawn's son, Allen, a composer and Bennington College professor, and they now have two children. She teaches creative writing at Bennington College and Harvard University.